Last night I was watching a home improvement show on cable television. 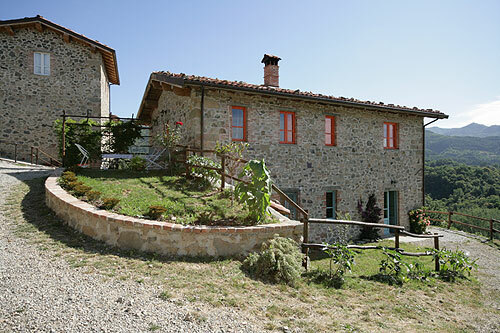 The show featured a famous former athlete renovating a farmhouse in Italy. It was part of a series, as the renovation of an entire home in another country clearly takes some time. Along the way, the show’s featured star visited street markets to find accent pieces and rustic antique shops to find the furniture pieces that would decorate his renovated home. At one point, he purchased eight dinner chairs for his dining room with the intention of sanding them down and repainting them a flat, sage green color. So far, so good. But when he went to choose the paint color, I nearly fell over in shock. The outside looks great, but what about the paint colors on the inside? Image courtesy of Your Way to Tuscany. While I can appreciate that not every paint store on earth has color-matching technology on par with a BYK spectrophotometer, I was shocked when the host chose a color mixed entirely by hand and without measurement. He told the gentleman behind the counter what color he wanted (“a flat finish green for my chairs…a bit darker than olive…”) and the man began mixing different colors in a gallon can until he had something approximating the requested tone. The two of them looked at wet paint on a stir stick and declared that it looked correct. Or at least, good enough. At that point the host went to paint the chairs. Predictably, the results were less than stellar. Although the show didn’t spend a great deal of time focused on the chairs, the star’s disappointment was hard to mask as the paint began to dry on them. He spent a few minutes trying to work the paint into other parts of the room as an accent so the chairs wouldn’t seem so out of place. Unfortunately, simply eyeballing some wet paint on a stir stick isn’t going to give anyone an accurate idea of the finished results after the chairs get painted and have a chance to dry. And while it’s possible (even likely) that the particulars and accuracy of a color choice on a television show are far less important then the colors professional painters work with in the real world, it is worth noting that many professionals still don’t utilize simple tools at their disposal for evaluating paint color. Looking at wet paint on a stir stick is not a good way to gauge color. Drawdown cards allow you to confirm the color has been mixed correctly. Drawdown cards offer a larger sample than a traditional paint swatch for the client to evaluate. Drawdown cards give the painter information about the spreadability, sheen, and thickness of the paint. Drawdown cards provide information about how the paint covers light and dark backgrounds and, as a result, how much paint may be required for the job. Drawdown cards are an inexpensive way for both client and painter to understand and confirm all important properties of the paint before money is spent on materials. In the television show above, using a drawdown card at the paint store would have given the host the opportunity to take a large, real-world sample back to his farmhouse and see how it fit in with the decor of the room. As we’ve discussed before, drawdown cards come in a variety of configurations that can simulate most any paint surface or substrate. Considering the negligible cost and minimum amount of time required to produce a drawdown, there is simply no excuse for professional painters who do not request drawdown cards in advance of every job. Having an accurate way to compare the color in the can with what dries on the walls, structure, or surface is a great way to ensure client satisfaction when the job is done. Click here to learn how to correctly perform a drawdown!